Though the Winterthur Museum did not officially open until 1951, it was from the beginning a museum – private, of course, but already poised to become the grand country estate it is today with remarkable design archives. Henry Francis du Pont, founder of Winterthur, was a visionary and advocate for American antiques and decorative objects. An avid collector, Mr. du Pont, was guided by a desire to furnish his 175-room house with the very best style and craftsmanship available. An outstanding example from Winterthur’s extensive furniture collection is an early 19th century Massachusetts settee which has been re-interpreted by the Currey design department to fit today’s interiors. The solid wood Chestertown Settee has a triple-slat back with decorative urns and ovals. 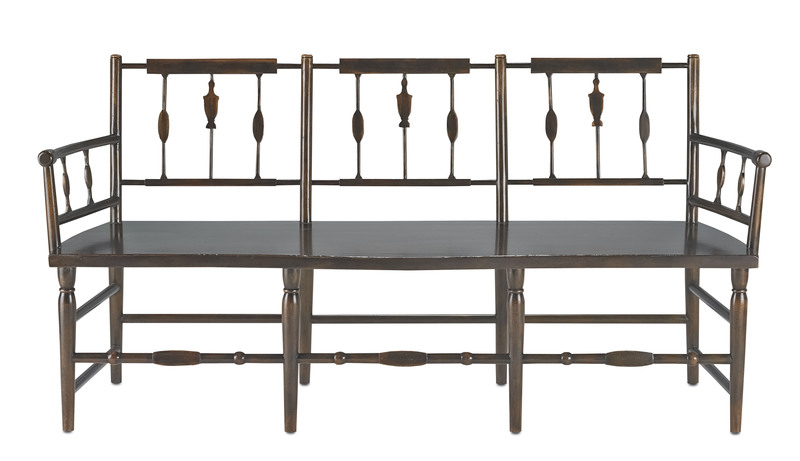 Simplified from the original, the settee has a rich, hand-applied Brandywine Mahogany finish. A 17th century oak cupboard from Duxbury, Massachusetts was the inspiration for the Tappahannock Chest. Like the original, this chest provides a lot of practical storage for today’s living environments. The chest is finished in Verona Walnut and embellished with oak & ebony veneers, split spindles, chip carving, and applied moldings in geometric patterns. 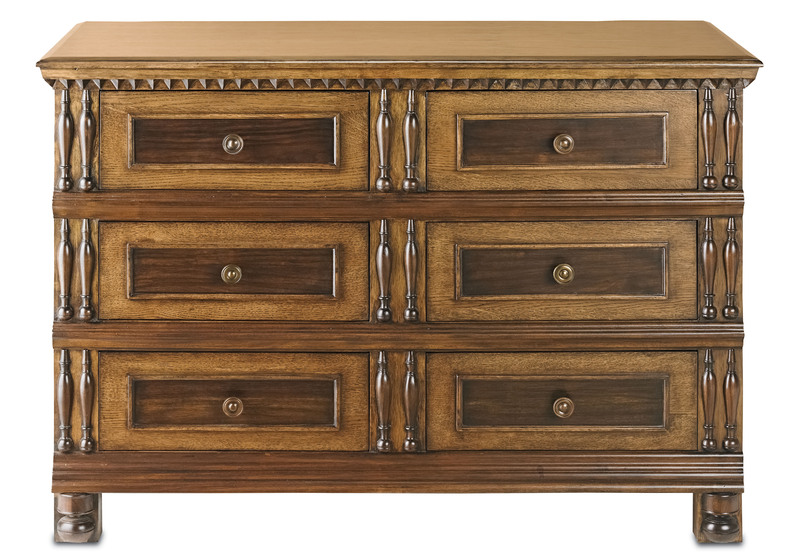 Multiple drawers make the Centerville Chest a most desirable piece for how we live today. The original chest housed at Winterthur was made in 1678 for John and Margaret Staniford of Ipswich, Massachusetts. Believed to be one of the earliest dated chest of drawers from New England, the chest was created by craftsmen in Essex County, Massachusetts. Currey’s version is updated in terms of scale, decoration and finish to fit a more modern setting. 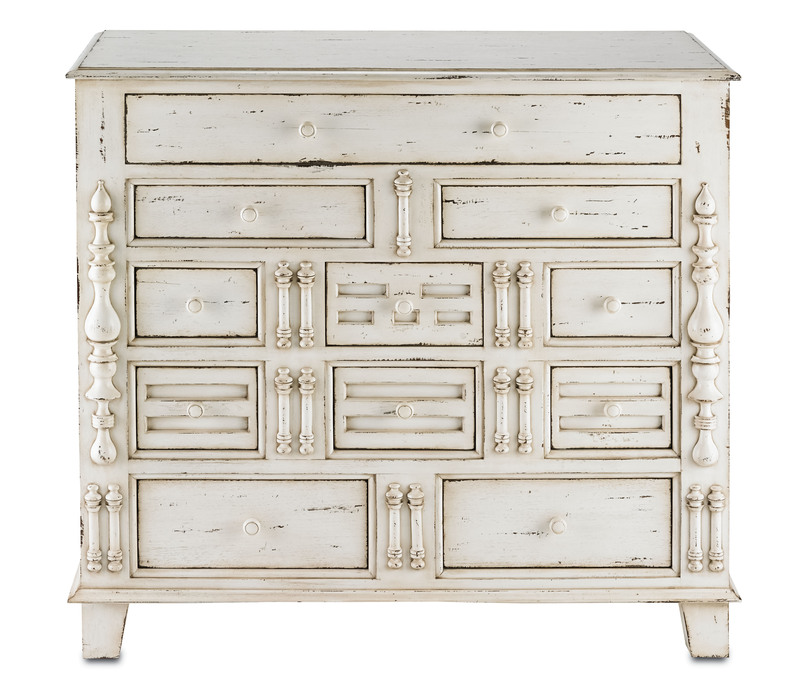 The solid wood Centerville Chest is decorated with split spindles and finished with a worn Dutch Cream finish that would fit beautifully in any room in the house or loft. We also have lighting in the Winterthur Collection that has consistently been among our best-selling products. The archives at the museum continue to be an inspiration for our design team. This entry was posted in Currey & Company, History, Products and tagged cabinets, design influencers, Furniture, seating, Winterthur, Wood on November 11, 2014 by Currey & Company.